As a public affairs officer for the National Aeronautics and Space Administration (NASA), Katie Hambleton (B.A. ’04) gives the public the inside scoop on the latest space initiatives, like a new capsule that’s going to take people deeper into space than ever before. She also writes about space phenomena and can tell you all about cell growth, radiation and dark matter like a seasoned expert. Hambleton has even mastered NASA’s plethora of fun acronyms, such as ELVIS (Expendable Launch Vehicle Integration Services) and SSIKLOPS (Space Station Integrated Kinetic Launcher of Payload Services). She never imagined she’d work for NASA. A Psychology major at St. Mary’s, she developed a passion for marketing, registering for every marketing course she could. One day while Hambleton was preparing for graduation, her Honors Program director asked about her plans after college. She explained that she was interested in psychology and marketing. “I had never thought about it like that,” Hambleton said. The conversation made Hambleton think about her career as a vocation and the importance of working for a company that has a mission aligned with her values. In a circuitous way, that one conversation led her to public service. 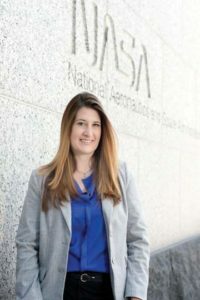 After graduate school at the University of Maryland, where she focused on social influence and attitude change in their Department of Communications, she landed a job at the U.S. Department of Health and Human Services in Washington, D.C., where she worked for several departments before joining NASA. Hambleton is proud of her work at NASA, but believes her greatest success has been never compromising her values. “I love the fact that I work for an organization with a strong mission. By respecting myself and my integrity, I am respected in my field and organization,” she said.